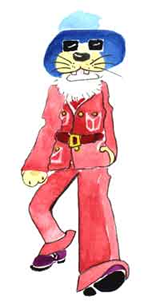 Who is The Clothes Lion! 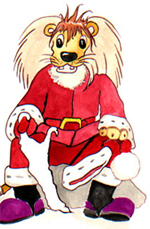 Clothes Lion - or "CL" as he liked to be called - wasn't content to lie 'round with his buddies all day, noshing on old bones, or sleeping. Oh no ! Not CL. He had big ideas. Truth be told, ol' CL fancied himself a pretty "cool dude." CL's Mom didn't really understand her son but, as all loving moms do, she told him to follow his dreams. CL took his mom's advice, and you can join his adventures in these stories . The Clothes Lion takes you on CL's wild trip to town to find a wardrobe. Find out what happens when he returns to his mother and friends. 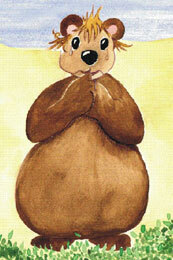 He also learns that even when he does silly things, his mom is always there for him. 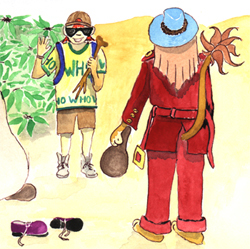 In this adventure, CL learns a lot about people he meets, about his friends, and - most important - about himself. 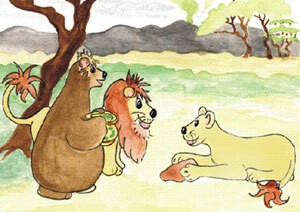 In The Clothes Lion Meets the Thread Bear CL befriends a lost - and very hungry - bear. CL invites the bear to join him and his mom for a yummy supper. 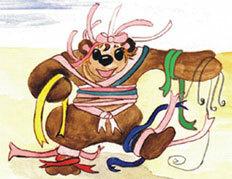 With her tummy full, the bear shares a surprising secret . . .
. . . she is none other than the Thread Bear! At last! A friend to share his passion for fashion. Working together they add some style to the lives of all their friends. 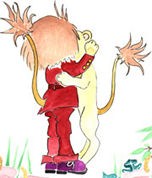 In The Clothes Lion and Santa Clothes CL meets Ralph, a little boy from far away. Ralph tells CL all about Santa Claus, and the two new friends hatch a plan to spread Christmas cheer as far as they can. 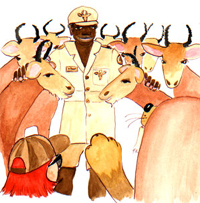 They do this with the help of Ralph's mom and dad . . .
. . . and 8 borrowed hartebeest. 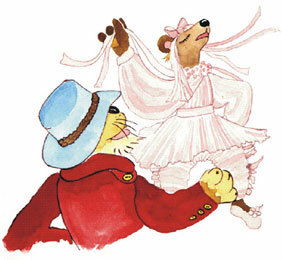 to dress up like never before and frolic around the village. Everyone has a wonderful time . . . even the hartebeest ('though to be honest nobody asks and they don't tell exactly what they think). 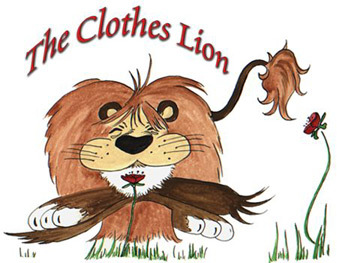 The Clothes Lion's Adventures are wonderfully happy stories for girls and boys to share with their moms and dads. Kick off a funtastic read!